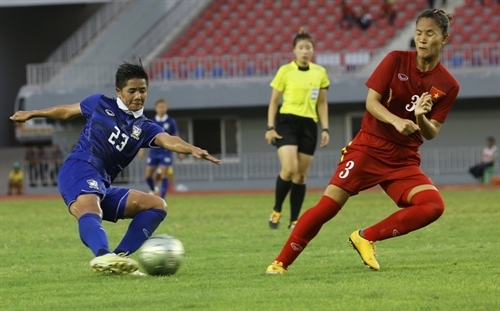 HÀ NỘI — Việt Nam defeated their arch-rival Thailand 2-0 in the final Group A round match of the Southeast Asian Women’s Football Championship on Saturday in Myanmar. Since both teams had earlier qualified for the semi-finals, they played without their best athletes. Việt Nam saved six key players, including goalkeeper Đặng Thị Kiều Trinh, striker Nguyễn Thị Minh Nguyệt and midfielder Nguyễn Thị Tuyết Dung. The Thais, meanwhile, played without four regular players, including strikers Thanatta Chawong and Tneekarn Dangda, who are playing in Europe. Việt Nam and their rivals took on a cautious approach, particularly in the first half. The urgency seen in earlier matches was missing, as the teams took their time moving forward in their attacks. The slower pace was understandable, considering that both teams had already qualified and were saving themselves for the crucial semis battle. Both sides had a fair share of attempts in the first half. Huỳnh Như and Phạm Hải Yến had whiffs at goal, but nothing really threatening. Thai strikers Kanjana Sung-Ngoen and Rattikan Thongsombut had their chances, too, but failed to convert them. The pace, however, picked up after the break, and this significantly improved the quality of the game. As the game progressed, Việt Nam pushed forward and began to get some of their shots into the net. Nguyễn Thị Nguyệt had at least two close calls. Her team’s persistence finally paid off in the 85th minute as Như pulled right and slammed Việt Nam ahead. In the final seconds, Nguyệt managed to sneak in a second goal. In the earlier match, the Philippines scored once in each half against Singapore, to wrest their first win here. For the record, Việt Nam, which scored 20 goals and conceded nothing, topped Group A with a maximum nine points in three matches. Defending champions Thailand finished second with six points, while the Philippines and Singapore placed third and fourth, respectively. Việt Nam will play hosts Myanmar in the semi-finals while Thailand will face Australian U20 squad.